Play if… you loved Prison Break (the tv show), or always thought you’d be able to figure a way out of jail in the event you were *coughs* wrongly convicted. Avoid if… you can’t even watch The Green Mile or Shawshank Redemption. Description (from the company website): You are facing life in prison, and you have one last shot at freedom. Will you take it? You and your gang of bank robbers have run out of luck and are on your way to a life sentence in the toughest prison in America. Luckily for you, one of the guards suddenly passes out, the victim of severe food poisoning. You’re still handcuffed, but you have 40 minutes to find a way off the bus and find freedom. Can you find a way to make crime pay? 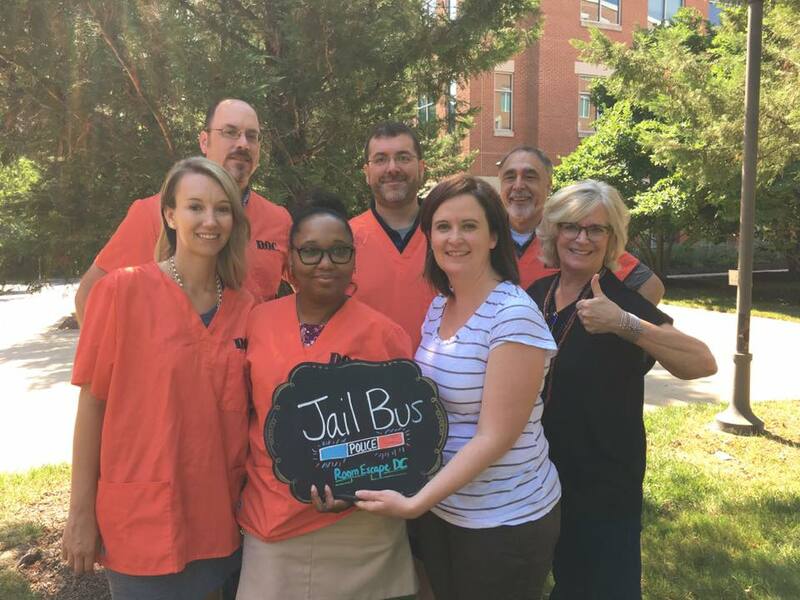 Only if you escape the Jail Bus, the top-rated escape bus in the US! Description of the room: The bus is an airport-shuttle style bus with a cage inside. Can’t really say more. 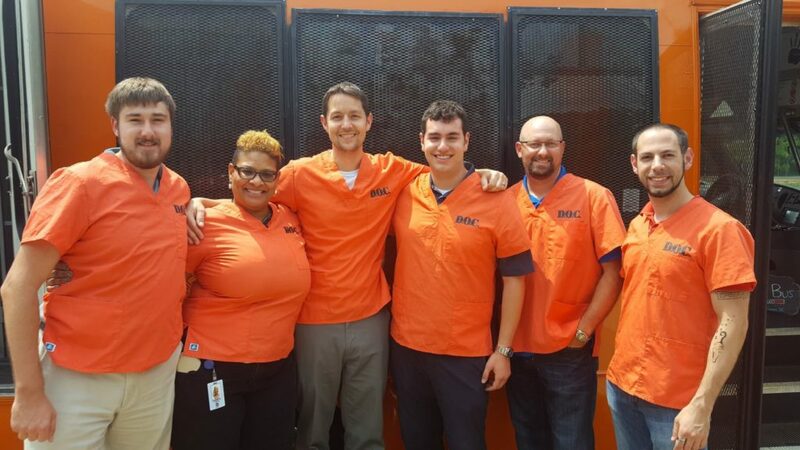 Understanding of the Mission: After the guard passed out from food poisoning, you and your fellow convicts have to do everything in your power to get yourselves out of the handcuffs and off the bus so you can be free again. Otherwise, back to jail, and this ain’t the Hilton… hell, it’s not even a Motel 6. 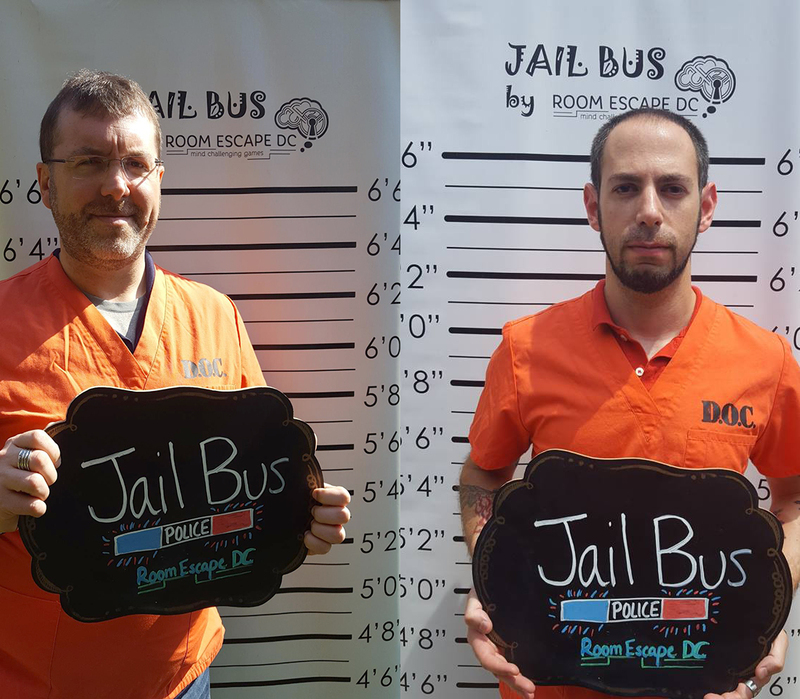 Mike (left) and Jason (right) had their mug shots taken right before they completed the Jail Bus. Our Suggested Party Size: It gets a little cramped, so we wouldn’t recommend more than 6. Did the room challenge the entire team? Yes, for the most part. Worth the time and money? If you can get a large enough group to offset the transport fee, absolutely. We both did this during work hours… at work, so really can’t go drinking anywhere. Lunch, well, that’s another story. Play if… you’ll try anything – food wise – once. Avoid if… cannibalism makes you queasy. Description (from the company website): You and your teammates wake up in a poorly lit cell and can’t quite remember how you got there. As you come to your senses, you can just make out three monstrous voices planning a party. It seems they’ve decided to have you over for dinner…in a manner of speaking. The ghastly group has left you unattended for just one hour to attend to the last details of their frightful feast, giving you just sixty minutes to avoid becoming tonight’s main course. Can you escape this disastrous dinner before the next course? Only time will tell. Good Luck. Description of the room: You start in a room with a table set for 3 people and several pieces of furniture. Almost looks like a kitchen. Almost. Understanding of the Mission: You’re trapped in a room where, if you don’t get out in an hour, you’re going to be prepped for a very ghoulish dinner. Our Suggested Party Size: We were 6, which was pretty perfect. 8 would be a little too crowded. 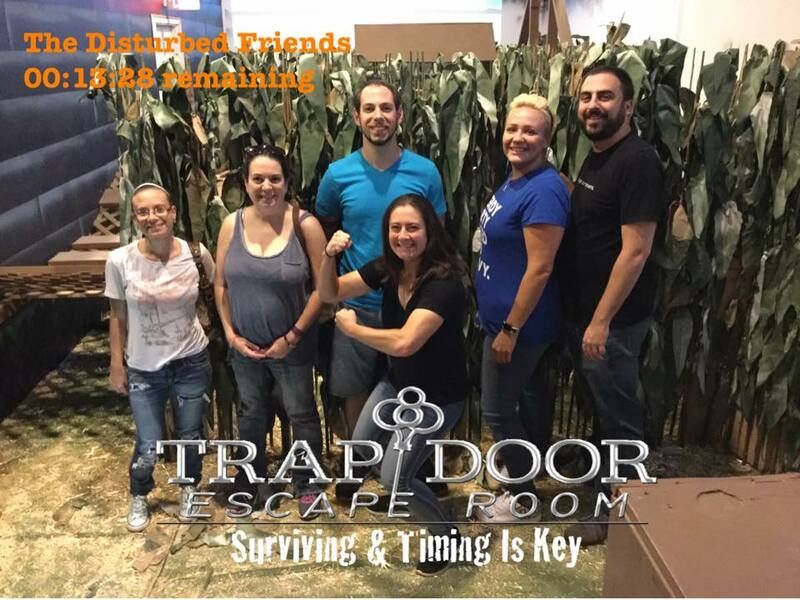 Team Disturbed Friends (Eric, Tara, Heather, and Katie) escaped the kitchen and easily avoided becoming dinner! 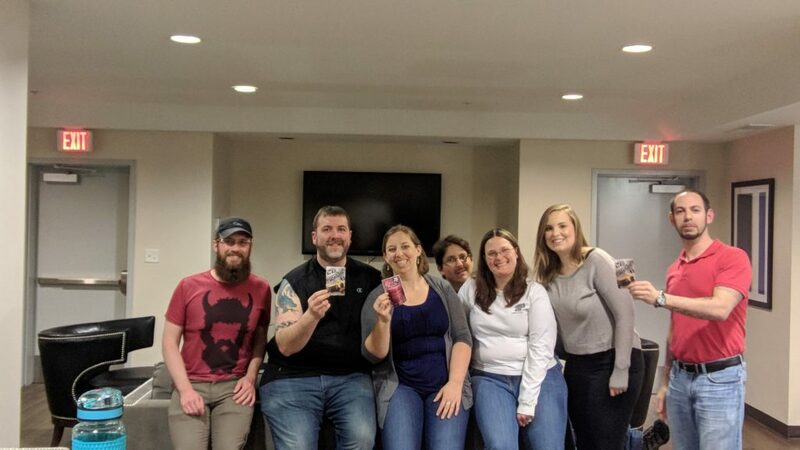 In our quest to do all of the escape rooms in the DC Metro area, Jason found a Groupon to a new location. 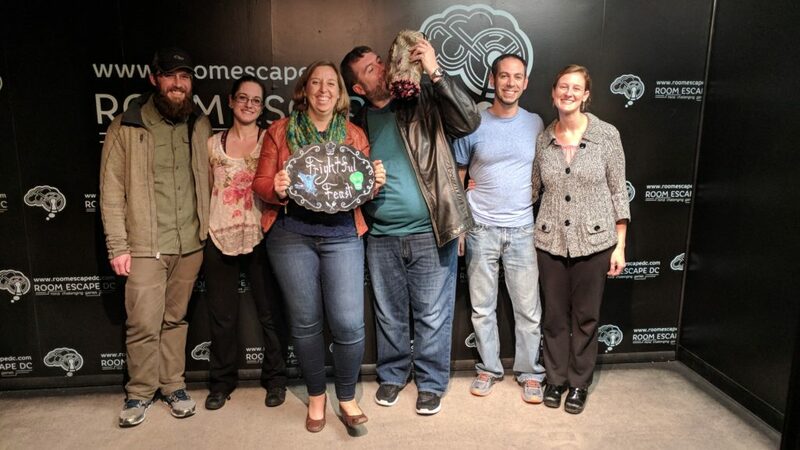 So, on a Thursday evening, we headed over to Calypso’s Escape Room in Tyson’s Corner, VA, where we completed The Lighthouse room (just the two of us). Then we interviewed Shaq, who told us about his locations and the themes of his rooms. Stay tuned here for our review of The Lighthouse. Check out and follow our social media channels below to be notified when new postings and interviews are published. Have you done this room? What was your experience like? You can add your comments to this post. Play if… you can focus amidst a lot of distractions. Avoid if… you don’t sing even while in the privacy of your shower. Description (from the company website): You will be escorted on a tour of the dreaded Zombie Lab where the out break of the virus was first discovered, You will be taken to the very spot that Doctor Oxy has isolated the strain of the zombie virus and was working on the only vaccine. Prepare to be locked in a room with up to 11 other people and a zombie that is chained to the wall! Hidden in the room is a key that will unlock the door to your freedom. To find the key, you must locate numerous clues and solve riddles. Every five minutes the hungry zombie’s chain will be released another foot. Within an hour, the zombie will be able to reach you. You have 60 minutes to the find clues, solve the puzzles, unlock the door and escape the room without getting eaten! Are you smarter than a zombie? Find out! Difficulty (1-10): Not rated, but we were told it only has an 18-20% escape rate. Cost: $30 per person – BUT, use ERG45 when booking your tickets to get 45% off per person! Staging Area: You are escorted from the parking lot by your host, who takes you back to the Professor’s office to sign your waivers. A short film and an explanation later, you are taken through the building to a hidden elevator. Don’t worry! There are restrooms to stop at on the way to your experience. Metro Access/Parking: Twinbrook Metro Station in Rockville is about a 15 minute (.8 mile) walk away. Otherwise, you can drive. There is ample parking in the lot, but follow your GPS closely as the address is kinda tricky. Description of the room: You start off in a small office where you are given some details about the room, and watch a short video while the Professor tries to sedate the zombie. Then your host takes you through the building to a hidden elevator where the Professor meets you and takes you down an elevator to the basement where the lab is located. The doors open and your adventure begins. Understanding of the Mission: You have been invited to the Professor’s lab to learn more about zombies. Unfortunately, as soon as you enter the lab, something goes wrong and a self-destruct sequence is triggered. 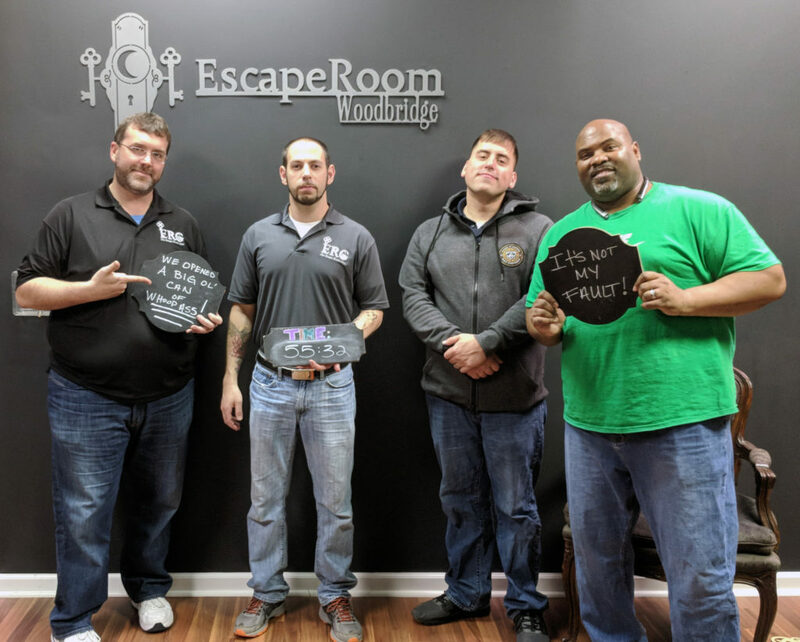 You now have 60 minutes to escape the lab by opening the locked door, saving yourselves, the brilliant (but sometimes nutty) Professor, AND the zombie (it’s a prime specimen that they don’t want destroyed). However, as you search for the way out, the zombie’s sedative wears off and it starts to come after you… with its chain getting longer every 5 minutes. Did We Escape: Yes, but barely! Our Suggested Party Size: The room holds up to 12. We had 8 and that was probably enough (if all are experienced). If you’re new to escape rooms, the maximum should work (the room is DEFINITELY big enough – at the beginning at least – for that many people). 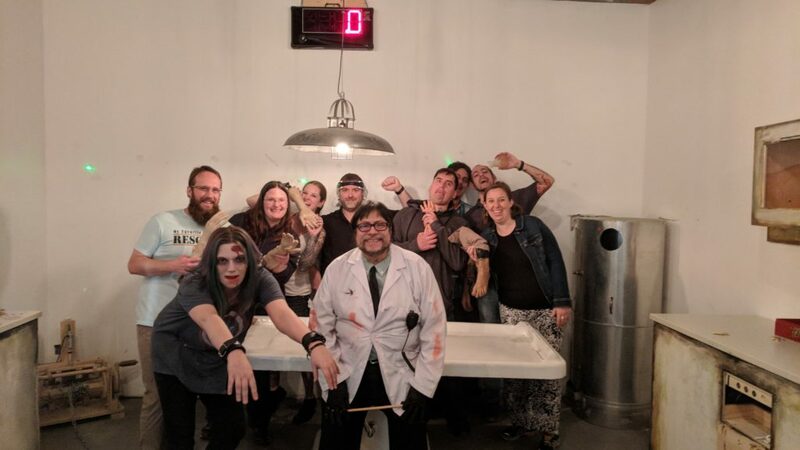 The Escape Room Guys and their Disturbed Friends (Eric, Brittany, Tara, Mike, Mark, Corey, Jason, and Heather) searched for a way out of the lab that was set to self-destruct. 7 Locks Brewing – we stopped in for what turned out to be some great beers after we did the room. Play if… you enjoy getting a little physical or tornadoes fascinate you. Avoid if… you’ve experienced one in real life. Description (from the company website): A tornado is quickly approaching! Can your team make it to the barn in time to ride out this epic storm? You will have to crawl, climb, push, pull, and of course, think your way through this obstacle course escape experience. IMPORTANT: F5 is a physical game! This experience involves obstacles and physical activity. Players should be able to climb over and crawl through obstacles, as well as crawl on the ground (with the help of teammates!). Staging Area: The storefront is on a main street in Morristown; there’s plenty of space to spread out and relax (there’s a coupla couches). Metro Access/Parking: It’s in NJ; drive or Lyft/Uber. Description of the room: You’re in a…field. There’s wind. And a barn. I’m saying literally 0 more about it. Understanding of the Mission: There’s a twister coming and you need to find a safe place to hide. Break into the barn, then into the storm cellar and wait it out. Our Suggested Party Size: I think 6 is pretty perfect here, though you could definitely do it with 4 skilled escapers. What happened to the Escape Room Guys?! 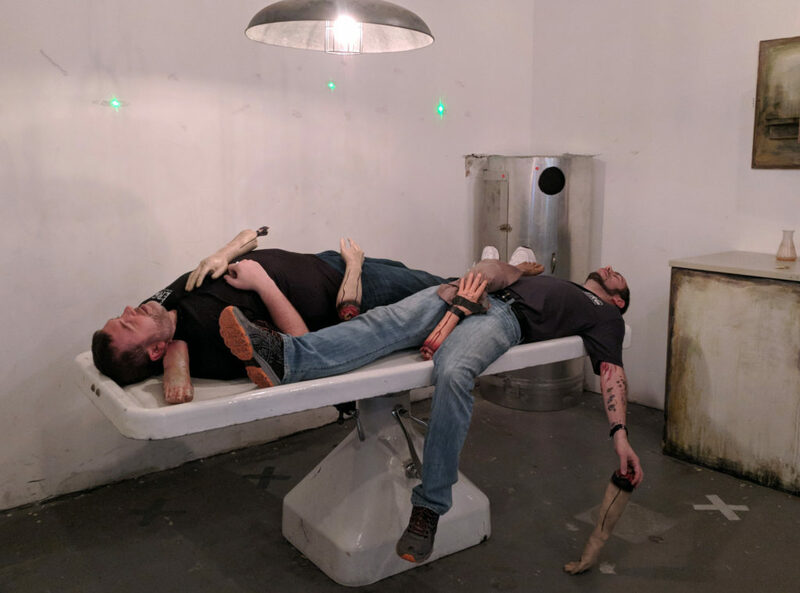 Check out our interview with Kevin “Hook” from Escape Adventure DC in Rockville, MD, who told us about his location, current room, upcoming new rooms (check out this one called “The Basement“), and why he feels that his location provides a unique experience to escape room enthusiasts. The ERG just completed his Trapped in a Room with a Hungry Zombie room, which features live actors! This room was a challenge, very well done, and a lot of fun, so you should definitely check it out. Kevin was kind enough to offer our followers a 45% discount when using ERG45 when booking the room. Stay tuned here for our review of Trapped in a Room with a Hungry Zombie. Check out and follow our social media channels below to be notified when new postings and interviews are published. Play if… you’re a fan of ’80s nostalgia. Avoid if… insects give you the heebie-jeebies. Description (from the company website): You poor dead souls! You’ve really screwed up. Your only mortal friend has been kidnapped by a dastardly bio-exorcist in hopes of escaping The World Of The Dead. Can you decode his name and save your friend before it’s too late? Description of the room: The room looks like the attic of a house with some furnishings, including a smaller replica of the neighborhood. Understanding of the Mission: As a newly deceased person, you need to figure out how to navigate the many rules of the afterlife using your handy handbook. However, you decide to take a shortcut and hire a bio-exorcist, against the explicit orders of your caseworker. Now, your memory has been wiped, and you have to remember the ghost’s name to rescue your living friend from the World of the Dead. Did the room challenge the entire team? Yes… and no. Read our ratings below. The ERG and team of Disturbed Friends (Mark and Alphonzo) rescued their friend from a horrible marriage to a bio-exorcist! Fair Winds Brewing Company – We hit up this place on a previous visit. Great for beer flights and a food truck. Play if… you loved science and chemistry in high school. Avoid if… equations give you anxiety. Description (from the company website): Since the apocalypse, things just haven’t been going your way. You’ve lost all your worldly possessions, and have been trying to survive in your dystopian neighborhood with the few survivors you’ve managed to meet along the way. And your chances of survival keep getting slimmer, what with this new outbreak of a horrible virus which is fatal, and rapidly spreading. Luckily, a brilliant scientist works in your neighborhood, and he created the only known cure. Being a rather paranoid individual, he protected the formula in his lab behind a safe wall of codes and puzzles. Now that he has fallen victim to insanity, he has disappeared and left his antidote in his lab. If you and your fellow survivors can work quickly, you can acquire the antidote before the virus infects you. Staging Area: A nice lobby with lots of seating near the front desk. They have bottles of water and a coffee machine(!) with coffee, tea, and hot chocolate. Restrooms are in the lobby of the building just before you enter their sitting room. Metro Access/Parking: It’s Manassas, so you’re going to need to drive. Plenty of parking in the lot, however. Description of the room: A room with scientific equipment and lots of equations on the walls. The person who lived and worked here was either a genius… or crazy (or maybe a bit of both?). Understanding of the Mission: Find the antidote to the virus before becoming infected. Our Suggested Party Size: 6-7 is good for a group of experienced people, but you’re going to need a full 8 if you don’t have experience with escape rooms. Did the room challenge the entire team? Yes! Members of our team (other than the ERG): Angie, Birgit, Sasha, Fahima, and one other. You’ll have to use Google since we didn’t go anywhere in the area after the room.